Web Hosting News – Redding, CT – On Tuesday, June 22, at 1 PM Eastern Daylight Time, Vanessa Fox will present “SEO & Website Hosting: What You Should Know” at Search Marketing Now. The webcast is free and is sponsored by Codero. Registration is open at Search Marketing Now. There’s more to SEO than keywords, back-links and compelling content: understanding the back-end technical aspects of a website are just as important in order for it to be seen favorably by the search engines and found by searchers. Vanessa Fox, widely respected industry expert and recent author of the book “Marketing in the Age of Google: Your Online Strategy IS Your Business Strategy,” will explore what every serious SEO should know about hosting — from what to expect from your hosting services, to understanding which databases to use, to diagnosing hosting issues and their impact on SEO. She’ll discuss everything from which server Operating Systems are used to how hosting services handle load balancing and redirects. She’ll also cover how speed affects SEO; how hosting services manage parked domains and aggressive bot traffic, and what to look for in a good SEO-focused hosting service. Vanessa Fox has been called a ‘cyberspace visionary’ by Seattle Business Monthly. She is a contributing editor for O’Reilly Found, a conference for web developers about SEO, and she is a frequent speaker at industry events. Previously, she created Google’s Webmaster Central. This webcast is sponsored by Codero. 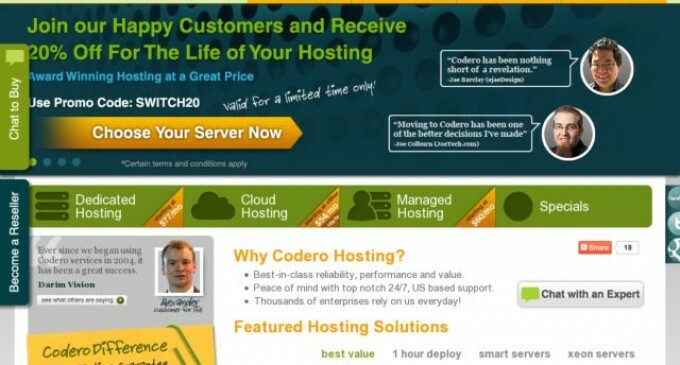 Codero delivers dedicated and managed hosting solutions on-demand for small- to medium-sized businesses. Drawing upon 15 years experience, live support is available 24/7/365 as part of a portfolio of hosted IT solutions, including Business Mail, eCommerce, and network, backup, and security services. For more information, visit www.codero.com. Search Marketing Now webcasts are produced by Third Door Media, Inc. Third Door Media’s mission is to empower interactive and search marketing professionals by providing trusted content and community services they need to be successful. Third Door Media produces the conference series Search Marketing Expo – SMX, which includes SMX East, SMX Advanced, SMX West and other SMX conferences. Third Door Media also publishes the search marketing news and analysis site Search Engine Land and Sphinn.com, the place for web, online, search, interactive and internet marketers to share news stories, talk within subject-specific discussion forums, build a network and stay connected to hot topics in internet marketing. Specializing in dedicated and managed hosting services for small- to mid-sized businesses, Codero’s technology portfolio includes high-performance Windows® and Linux servers delivering advanced email, eCommerce, security and networking solutions. All Codero products are backed by secure data centers, live 24/7/365 U.S.-based support and a seasoned staff with international experience in the hosting business for over 15 years. An industry innovator, Codero recently launched its Codero Rewards program and the Green with Codero Initiative, powering 100% of its dedicated server and managed hosting operations through renewable energy credits. For more information about Codero, please visit www.codero.com. Research, evaluate and learn more about Virtual Private Servers at FindMyHost.com.